During WWII, the 384th Bombardment Group was part of the Eighth Air Force and was assigned to the Grafton Underwood Airfield in England. Today, the 384th Bomb Group Commemorative Wing Panel Project provides 384th Veterans a chance to sign their names on a genuine wing skin panel from a WWII B-17G. The panel travels all over the United States for interested 384th Veterans to sign. In 2008, 384th Bomb Group NexGen (next generation) member Christopher Wilkinson came up with the idea of a B-17 part for 384th Veterans to sign. Chris had seen the B-17G Aluminum Overcast and noticed the Veterans’ signatures on the bomber’s crew door. Fellow group members loved the idea and began their search for a suitable B-17 part. Two years later, Carl Scholl generously donated a genuine B-17G wing skin panel to the group. Carl is a partner with Aero Trader of Chino, California, a warbird restoration firm. The panel was built during WWII by the Briggs Manufacturing Company and is a wing stress panel used to enclose the fuel tank. Cory O’Bryan, a warbird restorer and artist of Ontario, California, generously donated his time to hand-paint the 384th Bomb Group shield and Triangle P tail symbol, the squadron shields, the Eighth Air Force shield, and the list of the support squadrons on the panel. 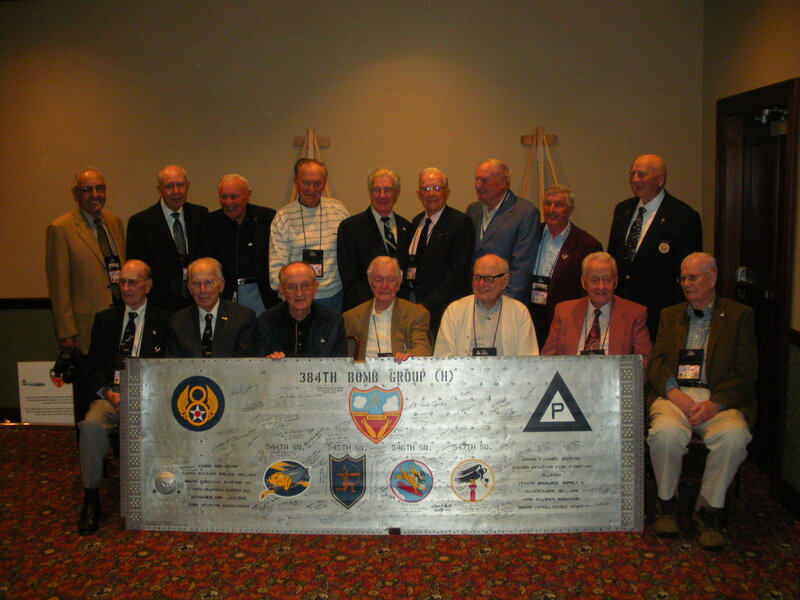 The first ten Veterans signed on October 12, 2010 at the Group’s reunion in Branson, Missouri. The panel has been a centerpiece at every reunion since, available for 384th Veterans who haven’t yet had the chance to sign their names. In addition to signings at the annual reunions, NexGen members travel the United States with the panel to allow all interested 384th Veterans the opportunity to sign their names. Since the start of the signing project in 2010, over 100 veterans of the 384th have signed. The B-17 wing panel acts as a testimonial to the spirit and camaraderie of the veterans of the Group, and will help to represent their personal message to future generations. The project continues as 384th Veterans are located. For Veterans that are unable to travel to reunions, arrangements are made to bring the panel to them, at no cost to the Veterans or their families. The project is supported by the Group’s NexGen members, and is solely for the benefit of the Veterans. The opportunity to sign the panel is not restricted to combat crew members. All who served in the 384th during training in the U.S., at the Grafton Underwood airfield in England during combat operations, and in post-war activities in Istres, France, are qualified to sign. Once all possible signatures have been collected, the wing panel will be placed on permanent display at the Hill Aerospace Museum at Hill Air Force Base in Utah. 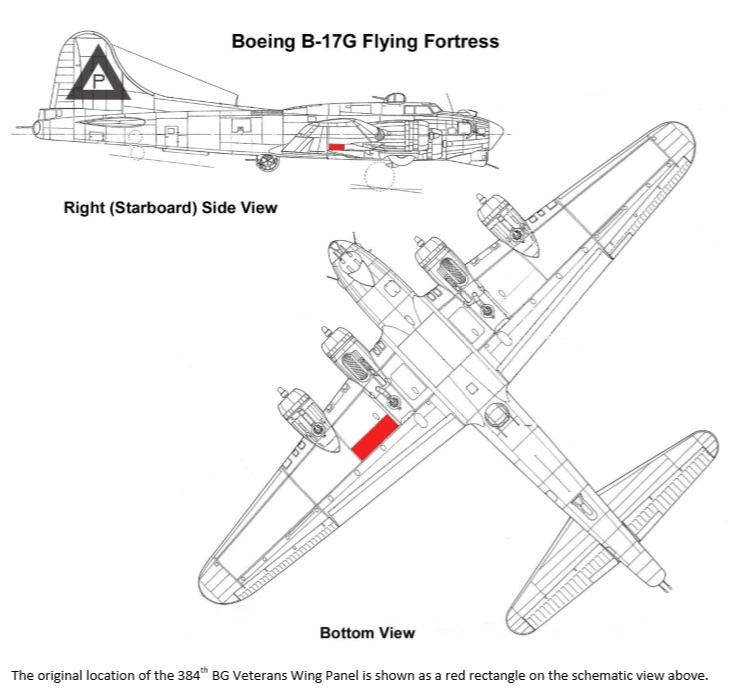 Qualified 384th veterans who would like to sign the panel are urged to e-mail B-17WingPanel@384thBombGroup.com. For more information about the 384th Bomb Group, click here. For photos of 384th Veterans signing the wing panel, click here. By thearrowheadclub in 384th Bomb Group Wing Panel Signing Project on March 11, 2015 .